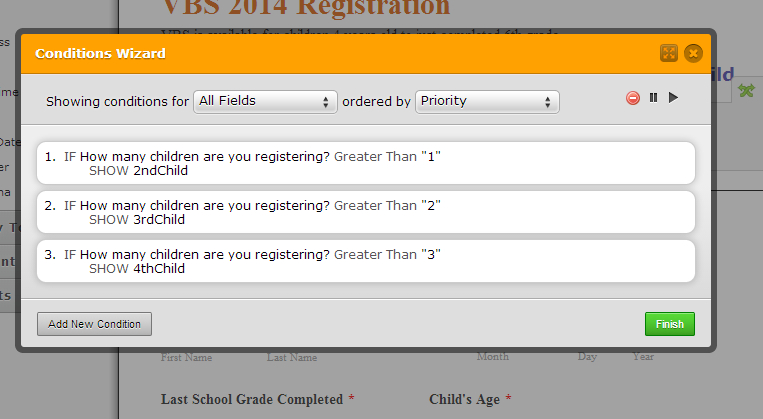 I've customized the Registration Form with two additional fields: "Child's Age" and "T-shirt Size". These fields appear on the form regardless of the value selected from the "How many children are your registering?" dropdown menu. > Can a condition be made so that these fields are hidden or visible based on the value selected from "How many children are you registering?"? Please see the form via the URL below. From what I see in your form http://form.jotform.us/form/41407820124141 I think you had it accomplished already, although using a different Show/Hide method. I made a demo form http://www.jotform.me/form/41446819209459 using the guide I mentioned. I used the Number field (in Quick Tools) instead of a drop-down field for the fiel "How many children..."
It seems there are conflicts among so many conditions applied on your form. As I investigated your form carefully with a view to correcting those, it took me more time than usual and made me really perplexed. Finally, I just cloned your form and deleted all the conditions applied before. Then I tried to apply new conditions on the cloned form in my own way and it worked just fine. Please check out the form which I cloned and corrected and feel free to Clone That to Your Account to learn how exactly this solution was implemented. Please let us know if this answer satisfies your query. Thanks very much! It looks perfect now and I'll definitely check out your solution. Just an FYI: All the Conditions you found must have come with the Nova template. I never accessed the Conditions panel. Thank you for updating us with the info. Contact us anytime should you need our assistance.